Mission: "To increase awareness of the importance of supporting local business and educating the public on the significant positive impact they have on the local economy by purchasing goods and services locally." 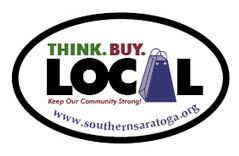 Spread the word through out Clifton Park and the Southern Saratoga County to BUY LOCAL. Now more than ever it is important to re-circulate dollars in our local community. The "Buy Local" campaign will be developed throughout the coming year by bringing awareness of the importance for consumers to purchase goods and services locally in order to sustain their community. The "Think Local. Buy Local!" campaign will encompass an awareness program including media advertising, point-of-purchase signage, discount programs and access to local companies' offerings through the Chamber. We want to secure the employment of our friends, neighbors and family. You are supporting local jobs by spending your dollars locally. Buying local strengthens area businesses, service providers and employees. Buying local contributes to our community's tax base and charitable giving. Business owners and managers in our region have a vested interest in their community's long-term health. Locally-sourced products are often "greener," because they don't require as many fossil fuels to reach you. Recycling your dollar by buying local is one more way to conserve natural resources. HOW To Spread The Word? Participate! Give businesses more visibility and credibility while keeping jobs and tax money here. Promote campaigns through media outlets, promotional materials, sponsorship opportunities, advertising and most importantly... Tell people about it! Use CliftonPark.com as your regional online source for local shopping! Find local businesses here. Every little bit counts! Start Buying Locally NOW!